B.I.R.D. 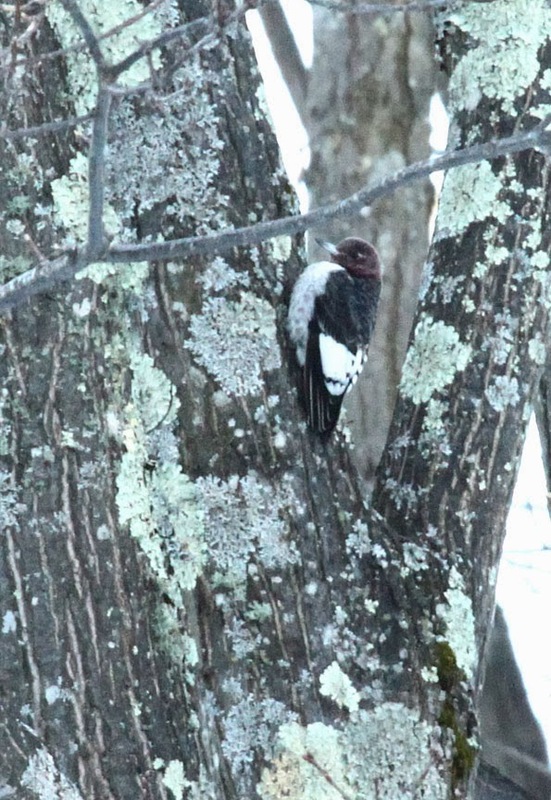 : Red-headed Woodpecker, a Rare Visitor! 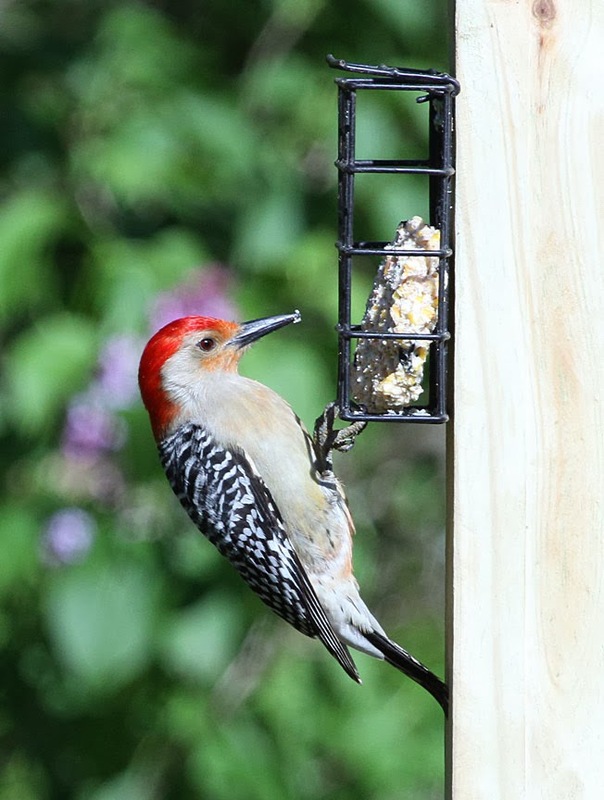 A "near threatened" species, red-headed woodpeckers, according to the North American Breeding Bird Survey, have declined on average by 2.7 percent per year from 1966–2010, suggesting a cumulative drop of 70 percent over the whole period. In Vermont, they were more common in the Lake Champlain Valley than where we live in the lower CT River area. Reported sightings are fewer and fewer every year. Here's a map showing their range and sightings. Whenever a report of a red-headed woodpecker surfaces around here, we usually discover it's a red-bellied woodpecker. They do have a red head, so it's easy to see how one would call it red-headed. But when you compare the two, you can see how different they are. The adult red-headed has a totally red head and neck, solid white belly, black tail and black wings with large white patches. 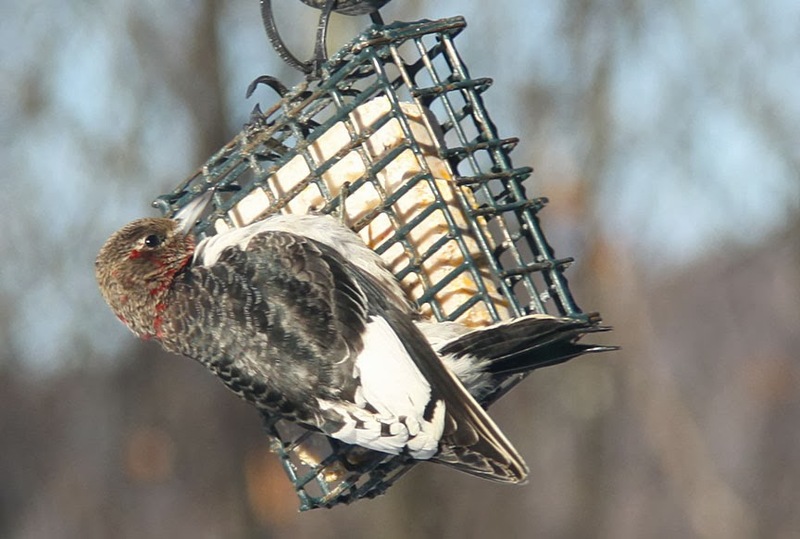 In the Alstead immature red-headed woodpecker, you can see the red feathers starting to molt in the head area and you can see the bold white patches on the wings. One nickname is the "flying checkerboard". The best part of this story is that the home owners are letting people visit their yard to see the bird!! Along with Don Clark, Gerry and I saw it this morning at 8:30. He/she (the only woodpecker where the sexes are indistinguishable) was very skittish, flying around the area, landing in a tree, coming once to the suet feeder and not staying too long. It was pretty cold standing still on an icy driveway while we waited for the red-head to appear, but SO worth it! !